Set up in a small garage in 1993, Oneida is now an industry leader in workshop hygiene and dust collection. The world-renowned company offers an extensive line of high-grade products that can help create a practical, healthy and safe workshop environment. They are based in Syracuse, New York City, United States. Now, let’s take a look at the industrial-grade dust collectors offered by the popular brand. This is a go-to option for owners of 1-2 man shops who want something that is quiet, powerful and compact. It features 3 HP U.S-made motor, radio frequency remote control, in-built fan blower and a super-efficient cyclone that pre-separates fine dust and debris before they get to the filter. The dust collector also comes with a 35-gallon steel-reinforced dust bin with an automatic fill level indicator and quick-release lid for easy emptying. Best of all is the static conductive resin construction, which helps ensure optimal airflow performance and keeps noise levels at a minimum. It is lightweight, durable and very easy to install. Next on the list is the highly-rated Mini gorilla dust collector. It is packed with several innovative features like the 1.5 HP US-made motor, and a high-efficiency cyclone for separating dust and debris. It also boasts a steel tripod stand with non-marking casters for easy mobility and a 22-gallon dust waste container with a viewing window. 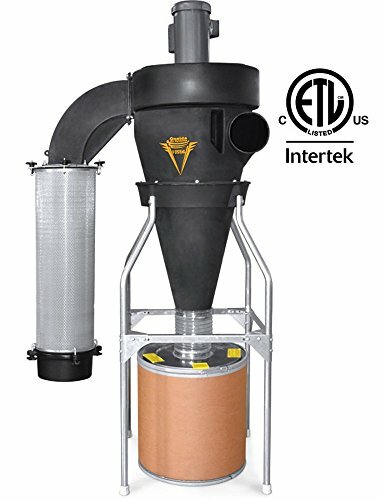 This dust extractor uses HEPA cartridge filters rated to efficiently capture particles as small as 0.3 microns and comes in a lightweight, compact design, which allows for easy maneuverability. 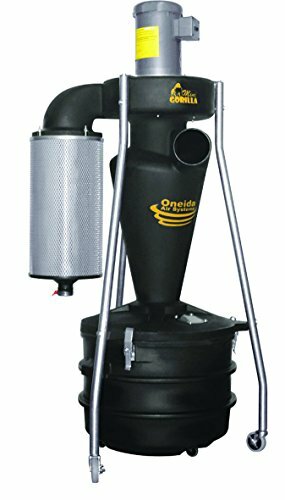 Oneida claims this may be the last dust collector you will ever need. It comes with a powerful 3HP US-made fan blower motor, hospital-grade HEPA cartridge filters, steel stand, and RF remote control starter. One of its coolest features is the high-efficiency cyclone separator that prevents the clogging of the filter, prolonging the tool’s lifespan. Smart boost technology, which compensates for any suction loss by adjusting the fan motor’s speed. It carries a two-year warranty. This is a better upgrade to the one described above. It also comes with HEPA cartridge filters, remote control starter, steel stand but has a more powerful 5HP U.S-made fan blower motor that provides ample CFM for up to three tools all at once. The super-efficient cyclone separator prevents filter clogging, extending the machine’s lifespan. One of the key highlights of this dust collector is the patented Smart boost technology which adjusts the fan motor’s speed to make up for any suction loss. The spacious (35 or 55 gallon) dust bill features an automatic fill level indicator and quick-release lid for easy emptying. What’s more, it also comes with stacking sound filter and drop-in silencer that help keep the noise level on the low side and a ductwork design guide, which can be handy if you want to assemble it yourself. This dust collector is one of the most powerful of the bunch. It features an industry-high 5HP US-made fan blower motor that delivers airflow for multiple tools at the same time. The high-efficiency cyclone separator helps provide continuous suction performance by eliminating filter clogging and preventing suction loss. It also has an internal acoustic foam which helps bring down noise levels and spunbond cartridge filters that provide unbeatable airflow and filtration performance. Another cool thing about the dust collector is the capacious 55-gallon dust collection bin that is very easy to empty. It comes with a two-year warranty and a design guide for do-it-yourselfers. What is not love about Oneida’s dust collectors? They are powerful, quiet and boast a lot of exciting features that ensure smooth operation and long lifespan. These include a remote control starter, sound filter, fan blower, anti-clogging cyclone separator, and many more. Available in different designs and models, these dust collectors are great options for anyone who wants to maintain a dust-free, safe workshop environment.